The Lundar Co-op Golf & Country Club is a double tee 9 hole, 3021 front and 2958 back yard course, with relatively soft greens and generous fairways that put tee shots and putting at a premium. The course includes putting and chipping greens, cart rental is also available. 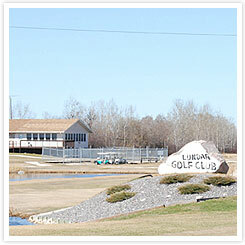 The club is located adjacent to Highway #6 on the northwest corner of town on Provincial Road 419 West. The Lundar Co-op Golf & Country Club is a fully licensed, wheelchair accessible restaurant with great food and excellent service! The Lundar Golf Course offers a variety of dishes for breakfast, lunch and dinner. Our breakfast selection is simple and straightforward aiming at those early morning golfers who need a quick bite before hitting the course.